Here are two more blocks for the Modern Spools Sew Along (for more details click here). The pattern is by Peta Peace. 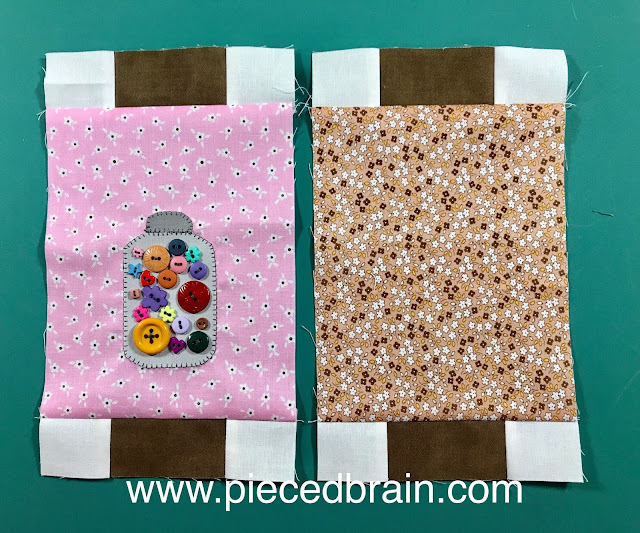 I love the button jar, a simple machine applique' motif with lots of colorful buttons sewn on top of it. These blocks are 5-1/2" x 9-1/2" so they are really fast to stitch up. I am using Penny Rose Fabrics by Riley Blake Designs and the collection is called Apple Farm. The prints are super cute. How are your blocks coming along? I like making one block with applique' and one without it and am glad the pattern is simple as I needed a break from more involved quilting projects.